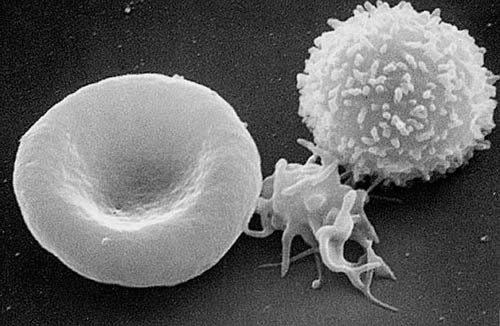 A three-dimensional ultrastructural image analysis of a T-lymphocyte (right), a platelet (center) and a red blood cell (left), using a Hitachi S-570 scanning electron microscope (SEM) equipped with a GW Backscatter Detector. This work is in the public domain because it is a work of the United States Federal Government under the terms of Title 17, Chapter 1, Section 105 of the US Code. This applies worldwide.